Our cat chip went missing the evening of the 25th. 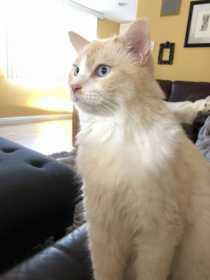 He’s a long haired white cat with some tan around his body and face. He has blue eyes, no collar but is microchipped. If you see him please don’t feed him, he’s on a prescription diet and takes medications. Please contact me with any info. Thanks!